Sounds good so far, but I am less impressed with their first product: Pop for iOS ($0.99, iTunes link). You can get similar apps with better cloud integration for free (e.g., Simplenote, about which I will write more soon). 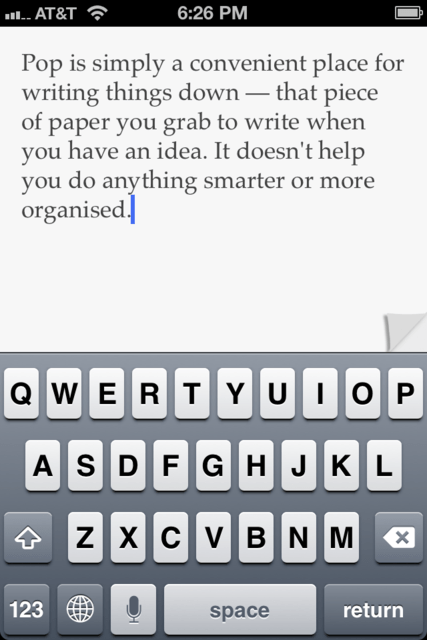 Also, Pop for iOS has no Mac equivalent like ByWord or iA Writer. Your writing is therefore a little bit trapped on your iPad or iPhone, which is counter-productive to a tight integration between your devices. I am a little surprised, since I am following Patrick Rohne’s blog for a while now (and I recommend you to check it out, too). Maybe the problem is that this particular space – note taking and distraction free writing – is pretty busy already. My hope is that the new development team has a one or the other ace in their sleeves, and that future apps will radically simplify other areas that suffer from feature overkill. But for now, while I am staying a reader of Patrick Rhone’s blog, the dollar stays in my pocket. By the way, what is your favorite note making app on the iPad or the iPhone? Are you working with Apple’s native app, or are you using a third-party app? Please let us know in the comments. Disclaimer: All images by Minimal Tools. Please consider sharing this article if you found it useful.